Ogilvy said this in 1963, and yet it’s still incredibly relevant. When’s the last time you told someone about news story or article you read, even though you only read the headline? We all do it! When you look at it this way, it’s impossible to deny the power of a good headline- now you just have to create one. That’s where 25 Headlines comes in! I discovered this site through a digital marketing course and it’s proven to be one of the best writing resources I’ve gathered so far. The site gives you 25 empty spaces, and your aim is to fill each one with a different headline option. 25 can seem like a lot (because it is a lot) but you don’t have to fill out all the spaces- you can do as many or as few as you like. I find that it’s best to start off with five and if you think of a few more, just keep going. As you can see from the screenshot, the site counts the number of characters each headline uses. The yellow, orange, and red blocks tell you if your headline is getting too long. This optimal length is decided based on the idea that you’ll be sharing your article on other sites, usually social media. There’s no point writing a great headline if it’s going to be cut off halfway through! For example, a Medium headline can have at least 66 characters on Facebook and 56 on Twitter without cutting off the end of the title. Every platform has its own character limit, but these are pretty easy to find with a Google search. 25 Headlines is a great way to get the mind flowing. One of the best ways to counteract writer’s block is free writing, and this is a free writing tool specifically aimed at creating a headline that will grab your readers’ attention. If you’re struggling to come up with the perfect headline for your article, using 25 Headlines is the electronic equivalent of taking out a fresh sheet of paper where your sole focus is inventing as many headline options as possible. The added bonus of 25 Headlines is it also measures the character count, meaning you can consider your options in terms of how they sound and how they’ll look when your article goes viral thanks to its amazing headline. 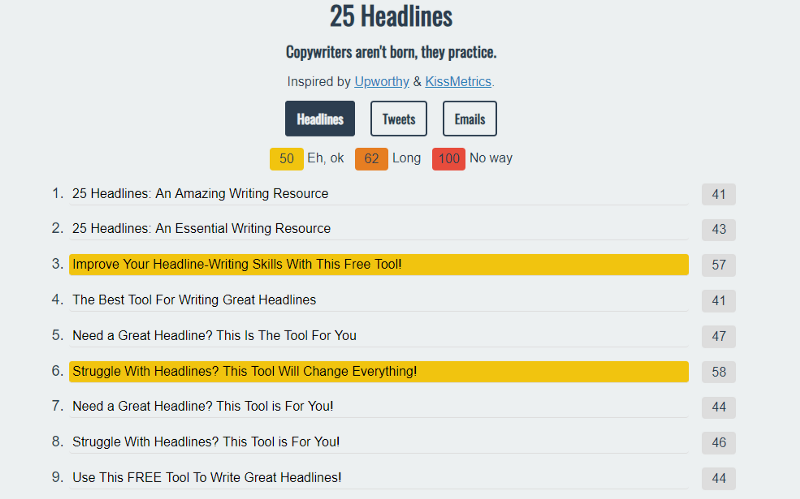 I’ve found 25 Headlines to be an amazing tool. As you can see, I used it for this article! I ended up choosing the fifth headline I came up with, and if I hadn’t used this tool, I’d only have considered two or three options. Looking at all the options, you might think I haven’t chosen the best one, but that’s the beauty of this platform- you can consider all the options and weigh them against each other. The next time you can’t think of a headline or the one you’ve come up with doesn’t seem quite right, head on over to 25 Headlines and just let your brain get creative! Not every option you create needs to be good or even realistic, it’s just about inventing headlines and trying out new styles until you find something that works. When you do find one you like, it’ll be the first step to a future of stronger, eye-catching headlines!